Perhaps you could measure both hulls. Then we can figure out the scale. 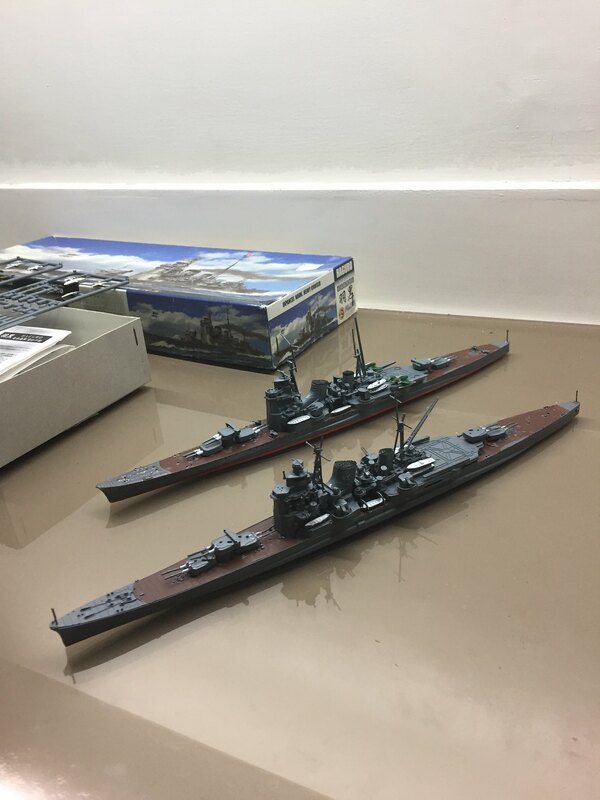 I found an old 1/700 Hasegawa/Minicraft kit of the Japanese cruiser Nachi while I was vacationing in the Philippines and I decided to do a comparative build of this kit as well as the new tool Fujimi 1/700 Haguro. I built the Fujimi Haguro in 1942 fit, while the Minicraft kit seemed to only have parts for the late war/1944 fit. The Minicraft kit was also missing parts, but I made the best of what I had; interestingly I was able to use some parts from the Fujimi kit to make up for some of those missing Minicraft parts. Here's pics of both. The Fujimi Haguro is to the right in both pics. Is it just me or the Fujimi kit is longer? Or is the Minicraft kit actually underscale? Anyways, I still have to add PE, find replacement for the missing parts, as well as add the floatplanes for the Haguro kit. 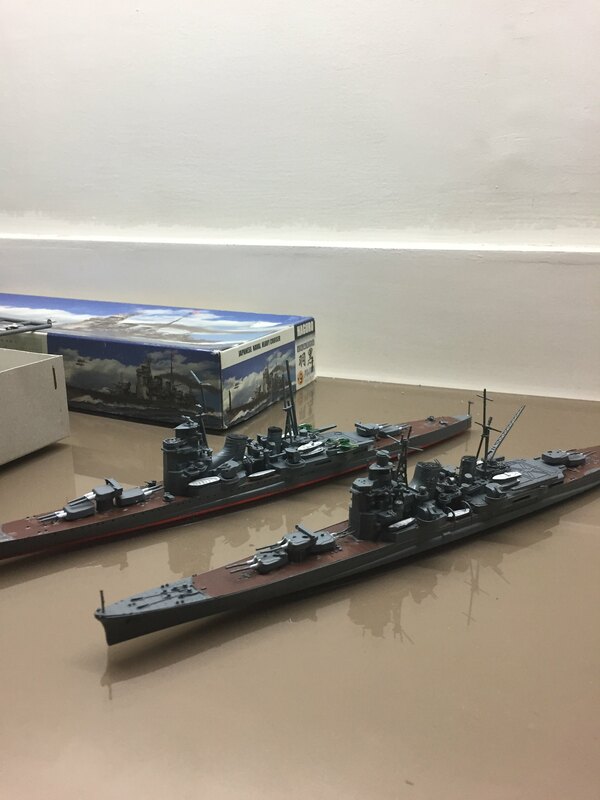 I found an old 1/700 Hasegawa/Minicraft kit of the Japanese cruiser [i]Nachi[/i] while I was vacationing in the Philippines and I decided to do a comparative build of this kit as well as the new tool Fujimi 1/700 [i]Haguro[/i]. I built the Fujimi [i]Haguro[/i] in 1942 fit, while the Minicraft kit seemed to only have parts for the late war/1944 fit. The Minicraft kit was also missing parts, but I made the best of what I had; interestingly I was able to use some parts from the Fujimi kit to make up for some of those missing Minicraft parts. Here's pics of both. The Fujimi [i]Haguro[/i] is to the right in both pics. Is it just me or the Fujimi kit is longer? Or is the Minicraft kit actually underscale? Anyways, I still have to add PE, find replacement for the missing parts, as well as add the floatplanes for the [i]Haguro[/i] kit.